The Latin American Mortality Database (LAMBdA) contains data on (a) census and vital statistics information on population size (starting in 1841) and death counts (starting in 1900) and up to 2014 for 19 countries; (b) life tables (every five and ten years) adjusted for undercount and for adult age misstatement by five and single year age groups (using 85 and 100 as open age groups); (c) mortality rates by causes of deaths (unadjusted and adjusted for completeness, age misstatement and ill-defined causes of death) starting in 1945, associated single decrement, and multiple decrement life tables; and (d) reconstructed (estimated) cohort life tables for birth cohorts born from 1850 onward. The resulting data are optimized for intertemporal and intercountry comparability (see figure below as an example). 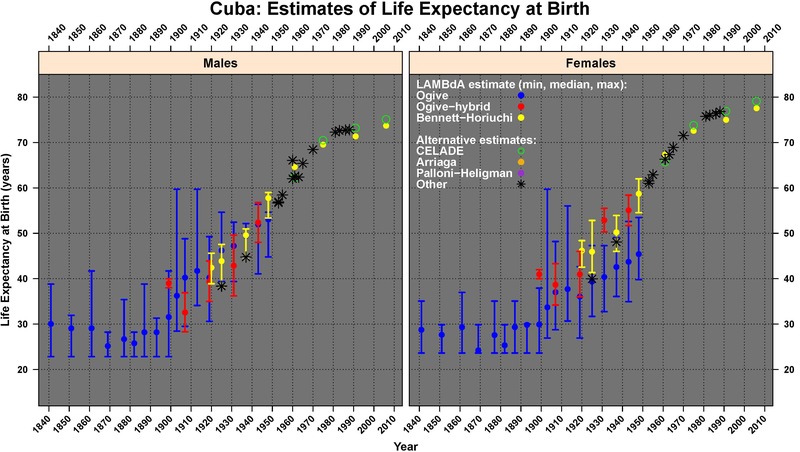 Additional figures shown here plot multiple estimates of life expectancy at birth for 18 of the 19 countries in LAMBdA (Bolivia is excluded) and for a period of time that starts with the first available population census. The figures include not only estimates produced by the team that created LAMBdA but also alternative estimates and associated bounds of uncertainty computed independently for each country and year of observation. In future releases of the data the bounds of uncertainty will be computed using techniques that allow dependency across time periods and geographically or culturally similar countries.